This tutorial will show you how to add a printer connected to the campus network to your Apple computer. In this tutorial we will be using the Library printer as an example, but the same procedure can be used to add most other network-attached printers. 1. 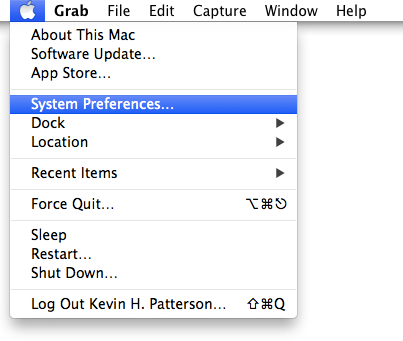 Choose “System Preferences” from the Apple Menu. 2. 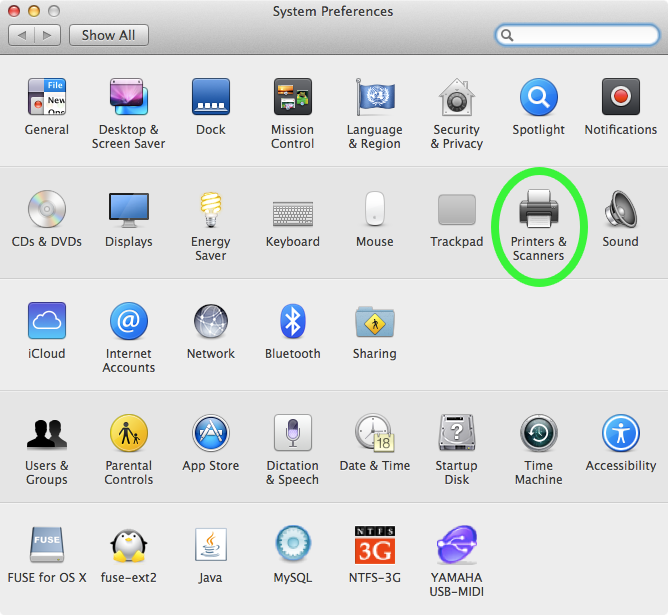 Click on “Printers & Scanners” in the System Preferences window. 3. 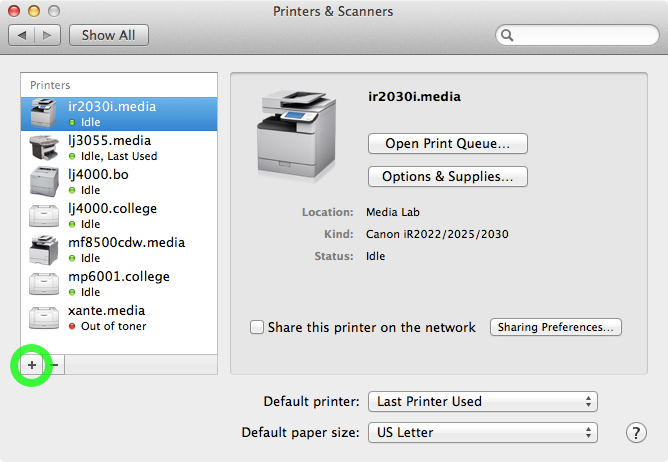 In the “Printers & Scanners” window, click on the small plus sign (”+”) at the bottom of the printer list. 4. In the “Add” printer window, click on the “IP” icon, then perform steps 5-7. 5. Enter the full network address of the printer in the “Address” box, and choose “LPD” for the Protocol. You must have the full network address for the printer you are trying to use. Most printers attached to the Hartland network have a white label showing the printer’s short name, which is also the first part of the full network address. 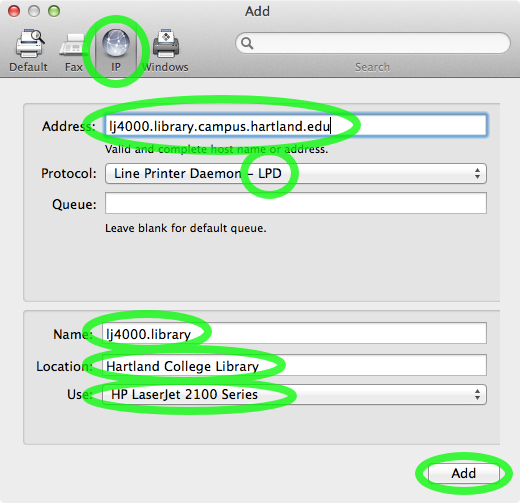 To create the full network address, add “.campus.hartland.edu” to the end of the printer’s short name shown on the label, and enter it in the box labelled “Address”. In this example, the Library printer has a label with the short name “lj4000.library”. The full network address for this printer is “lj4000.library.campus.hartland.edu”. 6. Name the printer and optionally describe its location. In the “Name” box, you enter the name of the printer that you will see when choosing a printer from applications like Microsoft Word. It is customary to use the printer’s short name (without the “.campus.hartland.edu” at the end), as shown on the printer’s label to minimize confusion. The last part of the name usually indicates the department or location of the printer. Enter a description of the printer’s location in the “Location” box. 7. 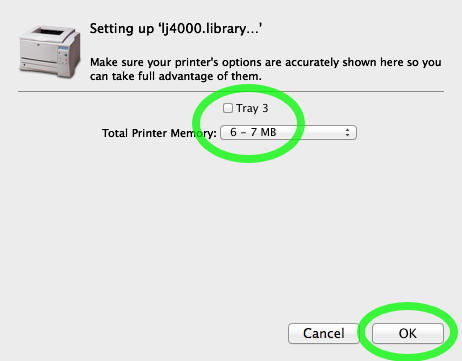 In the “Use” list, choose the correct driver for the printer you are adding, then click “Add”. 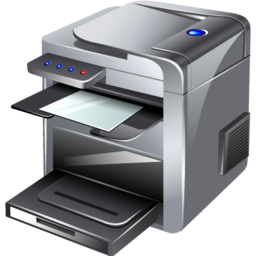 In most cases, Mac OS X will select the correct driver for the printer automatically. Drivers for most regular network printers used on campus are already included with Mac OS X, or will be downloaded automatically when you install the printer (please make sure you are signed in to NetAccess so the download can complete if necessary). In this example, the Library printer is an HP LaserJet 2100. If you have to download a driver for the printer you are trying to use, close the Add printer window, run the driver installer, and begin this procedure from step 1 again. 8. Set printer options and click “OK”. Some printers can be configured with a variety of options like additional paper trays or duplexing capabilities. Please select the options that are installed and match the actual, physical printer. If you need assistance, contact the IT Department. Note: Printers without configurable options may not display this window during the installation process.